It is often said that character is what you do when nobody is watching. This means that who you really are is demonstrated in how you do things when you think that no one knows what you are doing. It also reveals a secret part of us that we usually keep hidden from the world, which may or may not be in keeping with what God wants us to be. This secret part of us includes our sinful attitudes, desires, behaviors, and practices. 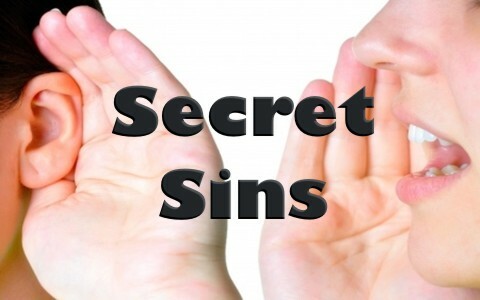 The question we have as Christians is do we have to tell anyone about our secret sins? There is no shortage of philosophies, books, belief systems, and opinions on who we are. Yet, nearly all of us agree that we have a public persona, private persona, and a secret persona. Our public persona is the one that people know publicly. It is who we are to the public. Our private persona is the one that people close to us like our close friends and family know. Our secret persona is the one that only we know – or at least, whom we think only knows. Who Really Knows Who We Are? Because God knows the things that we think and the things that we do, He is the perfect judge of these things whether or not they are sinful because as God, there is no secret that we have that He cannot reveal (Jeremiah 11:20; Matthew 10:26; Luke 12:1-3). Simply stated, God knows our secret persona and if He knows our secret persona, He knows our sins. What Are Our Motives for the Things We Think and Do? Scripture tells us that there are three human motivators that we inherit from our sin nature that we live with from birth. These are lust of the flesh, lust of the eyes, and pride (1 John 2:15-17). Lust of the flesh manifests itself in our innate desire to satisfy our physical flesh. Lust of the eyes manifests itself in our innate desire to have things that others have. Pride of life manifests itself in our innate desire to be well thought of or desirable to others so that we receive attention and accolades from them. Humanly speaking these innate human motivators are at the root of our temptation to sin (James 1:13-15). What Are We Called to Do When We Sin? The first thing we are called to do is to repent, or change our mind about our desires to sin (Acts 3:19; Acts 17:30). Some say that to repent, we must turn from sin. However, turning from sin is an action that should take place because we have changed our mind (Acts 26:20). Likewise, if repenting includes turning from sin, then God is a sinner because we see in Scripture that He repented many times (Genesis 6:6; Deuteronomy 32:36; Judges 2:18; 1 Chronicles 21:15; Psalms 90:13; Psalms 110:4; Jeremiah 4:28). It is this changed mind that leads to the desire to be forgiven (Romans 10:10-11). However, God does not just want us to hear the Word and change our minds, He also wants us to do something about it (James 1:20-25). The next thing that we are called to do is confess our sin to God (1 John 1:9). This too takes place in our mind. However, in cases where we have offended or harmed others, we also need to confess our sins to them and ask for forgiveness (Numbers 5:7; Nehemiah 1:6; Nehemiah 9:3; Psalms 32:5; Proverbs 28:13; Mark 1:1-5). This is because forgiveness involves a transaction between two people. In the case of God, it is a transaction between God and man. This is why in 1 John 1:9 we are told “If we confess our sins, he is faithful and just to forgive us our sins, and to cleanse us from all unrighteousness.” We humble ourselves before God and confess our sins from our repentant heart and He forgives us of our sins. With others, we humble ourselves and confess our sins against them and ask for forgiveness and they complete the transaction by forgiving us. This is why we are commanded to stand ready to forgive others (Matthew 6:14-15; Matthew 18:21-35; Mark 11:25-26; Luke 6:37; Luke 17:3-4; 2 Corinthians 2:5-11). This verse teaches us that we should confess our faults one to another and pray for each other because it makes a difference in our lives and the lives of others. When we allow ourselves to be accountable to others, it makes a big difference in our motivation to live a life that is pleasing to the Lord. It does not matter if the sins we confess are public, private, or secret. Confessing them to someone and praying with and for that other person allows us to help each other to not only be accountable for ourselves, but to love and support one another to grow in discipleship to the Lord (Proverbs 27:17). Therefore, if we are to have an “accountability partner,” we should choose someone who will keep private conversations private and have a sincere desire to confess and pray with us as well. It is often said that character is what you do when nobody is watching. Nearly all of us agree that we have a public persona, private persona, and a secret persona. Our secret persona is who we really are and is known by us and God. However, our secret persona also conceals a knowledge of sins that no one else knows about. God commands us to repent and confess our sins. This includes repenting and confessing to God and others that we may have sinned against. However, if we hold secret sins, we should have someone that we can go to in order to confess the secret sins and pray with the person so that they are able to work together with us as an accountability partner. This will make a great difference in our lives and the lives of our partner.